The following article was published on October 31st in the Seattle Globalist and the Seattle Times, and was written by Sarah Stuteville. The Cascadia Caravan was a caravan that included three buses painted in Cascadian colors that drove down and attended the national ‘Tear down the walls convergence’ in Arizona earlier this year. A group of Northwest activists are headed to the Mexican border on a nine-day bus trip, dubbed the Cascadia Freedom Caravan. Getting 20 people, including a baby, loaded on a bus and ready for a nine-day road trip to the Mexican border takes time. I showed up at the end of a long gravel driveway in Olympia about an hour and a half before the intended departure time of the “Cascadia Freedom Caravan,” and the only signs of packing were some chickens quietly clucking among boxes packed with almond milk and granola. Well, there were a few small groups of people resting in the shade of the bus freshly painted in wide blue, green and white stripes. The colors represent the Cascadia movement — a loose affiliation of folks who believe the Pacific Northwest should be its own nation. As far as secessionist movements go, Cascadia is pretty tame. Often evoked at Sounders or Portland Timbers games where the movement’s flag, the Doug, sails high, or as a way to market a microbrew. “Secession Cascadian Dark Ale” from Hopworks Urban Brewery in Portland . Cascadia is more an expression of regional pride than a political movement. The goal of the gathering is to build alliances and inspire activists, many of whom were involved with the Occupy Movement. But it’s clear that immigration is an important issue for many of the riders from Olympia, especially given long-standing political connections between Olympia and Latin America. 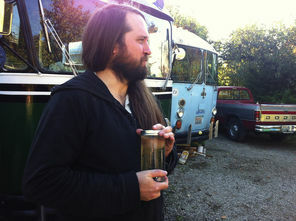 Rick Fellows, who has lived in Olympia since 1979 and is the Freedom Caravan’s official mechanic, is a veteran of more than 60 political caravans throughout the U.S. and Latin America. That includes a number of rides that broke U.S. embargoes against Cuba by bringing supplies into the country via a bus from Olympia to Mexico (where supplies were then flown on to Cuba). Some riders are newer to the issues. “I’m just excited for everything we’re going to learn,” says Nick Brashear, an Evergreen State College student who says a trip to Mexico piqued his interest in border issues and immigration. Beyond the politics, there’s excitement about the road trip itself. As the sun lowers and more people arrive, all take time to admire the vehicle that will be their home for the next week-and-a-half — a vintage school bus with spray-painted chess boards on the tables and plywood bunks suspended from the ceiling. It looks like close quarters for 20-somethings. But the striped purple and mustard curtains are so cheery — and the anticipation of impending adventure so infectious — that my concerns over bathroom stops and privacy soon retreat. By the time the bus engine roars to life, plumes of exhaust mixing with the smoke of hand-rolled cigarettes, departure time has long come and gone but no one seems to mind as folks claim their seats. Fellows jiggles the gear shift and steps on the gas. Tree limbs thwack against the windows and the passengers cheer as the Freedom Caravan hits the road — a little piece of Cascadia heading south.